Whether you are a do it yourself enthusiast who wants to do small woodworking jobs at home or whether you are a professional woodworker, you have to consider several factors such as price, capability, ease of use, portability, etc. before purchasing a saw. The aim of this Rockwell RK7241S Table Saw review is to provide you with in depth details of this saw along with its performance, accessories available, the types of work it is suitable for, as well as the price. This review also compares this Rockwell model with other similar models available on the market, so that you can decide which one is better suited for you. You can rest assured that this review is unbiased and is based on my experience of the saw being reviewed. This contractor table saw is a power horse that takes everything you throw at it effortlessly. Apart from its ability serve as a professional equipment for numerious applications such as roofing, installing floors, etc. it is ideal for huge DIY projects as well. The folding fence that this unit boasts of allows you to make extra wide cuts sans any issue. The icing on the cake is that the cutting depth of the RK7241S is far superior to other models in its category. Q: Does it accept a Dado blade? Q: What is the amperage of the motor? Q: Is it belt driven? What is my take on this saw? Based on my experience, this model is ideal for both the professionals and for the do it yourself enthusiasts as well. This unit boasts of many features that are essential for certain serious projects. The additional features of this saw combined with its accuracy are the main reason why seasoned professionals opt for this model. Precision and power are unarguably the two most vital things in a great table saw. The saw should have the ability to deliver precision cuts unfailingly, as well as be powerful enough to tackle all kinds of materials. The RK72415 has the ability to deliver both. Do not let the 15 amp motor, which is common on most such units, fool you. The motor of this saw rotates at a mind boggling speed of 4,800 RMP without any load, which is miles ahead of the competitors. As this saw can handle pressure treated lumber and hardwood with equal ease, you can undertake serious cutting with it. I need not say that this saw cuts through soft materials such as plywood as a hot knife slices through butter. The out feed support of this unit supports incoming lumber brilliantly, and catches wood without the need for additional tables, saw horses, or rollers. Coming from the stables of Rockwell, I was not surprised by the capability of the saw. However, I was a bit disappointed by their support staff that was not available all the time. As this unit can effortlessly handle all types of materials, it is ideal for professionals. As it is easy to use, amateurs can learn most features in a couple of days. The power of the gadget is such that users can cut a 4×4 piece of wood in one go with it. While certain other saws too boast of power, they pale in comparison to the Rockwell RK72415 when it comes to precision, thanks to the incorporated Rockwell’s LaserGuide technology. This saw has a maximum cut of 2-9/16″ at 45º and 3-9/16 at 90º. Apart from this, this model has the biggest rip capacity amongst the 10″ table saw category. This unit contains Rockwell’s LaserGuide technology. This laser guide system permits users to see exactly where the blade is going to cut, allowing users to make accurate and precise without fail. This feature comes in handy while handling delicate woodworking jobs that demand 100% accuracy. The biggest advantage of the laser beam is that it automatically adjusts itself when an individual uses this unit for bevel cuts. Transportation is one of the issues contractors face with most big power tools, while moving the gadget from one worksite to the other. The RK72415, along with its integrated wheels makes it easy to carry. The design of this gadget allows users to use an extended leg as a pull handle too. To facilitate transportation, one can store all detachable accessories on board such as the blade, push stick, riving knife, rip fence, dust bag, and miter fence. The unit comes fully assembled saving time wasted in assembling. Further, the stand is made from durable material, allowing it to effortlessly withstand extreme conditions of the construction site. Users can fold the stand in a couple of seconds, providing ultimate convenience while on the job. The included user guide contains comprehensive details about maintaining this machine. Maintaining it as per instructions provided ensures that the gadget provides you with years of faithful service. The saw includes accessories such as the push stick, blade, rip fence, riving knife, miter fence, blade wrenches, and dust bag. The RK72415 is an extremely versatile and power device making it a dream tool for professionals. The ease of use and the ability to be used out of the box without setting it up makes it a favorite amongst the DIY aficionados. Therefore, this saw is suitable for all types of users. This is extremely tough to say considering the versatility, features, and affordable price of the tool. However, I wish the manufacturers would replace the plastic parts with sturdier metal parts. The manufacturers should also change the sturdiness and design of the foldable legs, as they tend to get unstable after using the saw for a couple of months. I do not mind if Rockwell charges more for the device but provides a comprehensive warranty. 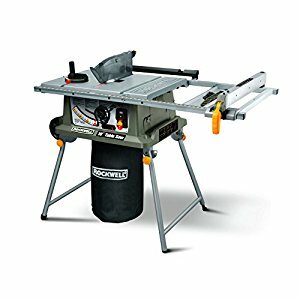 Rockwell RK7241S vs Bosch 4100-09 table saw: Both units include a 10 feet cord, operate on 120 Volts at 15 amps, have 10 inch diameter blades. While the Bosch scores higher on the bevel angle range, the Dado width/diameter, the Rockwell is better in max cutting depth, the no load rotations per minute of the motor, the number of accessories, and ripping capacity. The Bosch has a dust port while the Rockwell includes a dust bag. The laser guided cut line indicator puts the Rockwell far ahead of the Bosch. Rockwell RK7241S vs Dewalt 745: Both have the same running voltage/ampere, and bevel angle range. While the former has a 10 feet cord, the latter lags behind with an 8 feet cord. Rockwell surges ahead in the no load rotation speed of the motor, the ripping capacity, Dado support, table dimensions, the number of accessories, and the precise laser cutting capability. Dewalt provides an additional year of limited warranty, and incorporates adjustable rear feet… useful when working on uneven surfaces. Rockwell RK7241S vs Ridgid r4516: Both have the same operating voltage and amperage. While the Ridgid is cheaper than the Rockwell, the user can find many alternatives for the former at the same price range. However, Rockwell wins easily because of features such as folding fence, fully assembled trolley, and its exclusive laser indicator. No other alternative boasts of the last mentioned feature. Could this be the reason that the RK72415 finds a place of pride in the top three best selling table saws? What do users say about this saw? Users across a wide spectrum appreciated the build quality of this saw, and were wowed by its innovative laser indicator. However, they equivocally condemned the fragile plastic parts, the unstable foldable legs that tend to become unstable after using the gadget for a couple of months. Most of them wished that the manufacturer increased the size of the dust bag, and included a comprehensive warranty instead of the limited 2 year warranty. I consider it an excellent tool. The fast rotation per minute makes cutting difficult jobs extremely simple. I was bowled by its portability as well as by its LaserGuide technology that allowed me to cut wood with hairline preciseness. The 30″ table to the right of the blade makes it the best rip cut saw in its class. I consider it the best tool in its category due to these amazing features and its pocket friendly price. While this tool is in the list of the top 3 best selling table saws, it can easily occupy the top position by replacing the plastic parts, such as the miter, with a metal one. If you want a table saw that can handle larger materials with super precision, look no further than the Rockwell RK72415.